The pontoon boat market today, offers a bit of everything from the simple model for fishing to the luxurious boat offering maximum comfort for a good day with the family. This is the category that holds the Bennington Q27, a boat full of surprises. Bennington Marine recently joined the Polaris group, but the boats remain manufactured in Elkhart, Indiana. The Bennington range includes models from 17 to 30 feet in five different series from the entry level to the most luxurious version with everything you can imagine (and even more) on a pontoon boat. The Q series is also not the most luxurious, but it is part of the high-end, recognizable in particular with profiled plating and its comfortable arrangement. The Q27 is 28 ft long for 10 wide beam. 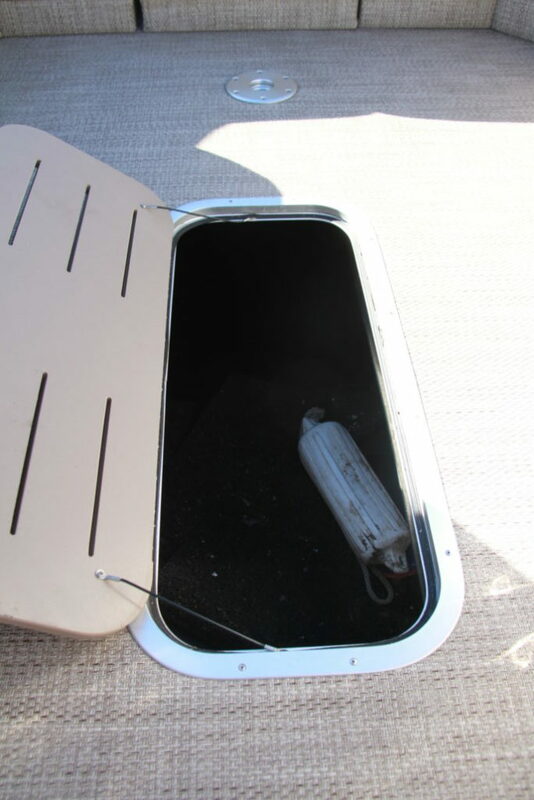 These dimensions offer a usable surface of about 269 square feet, rather good for spending a day at sea and for organizing the boat as you want to. 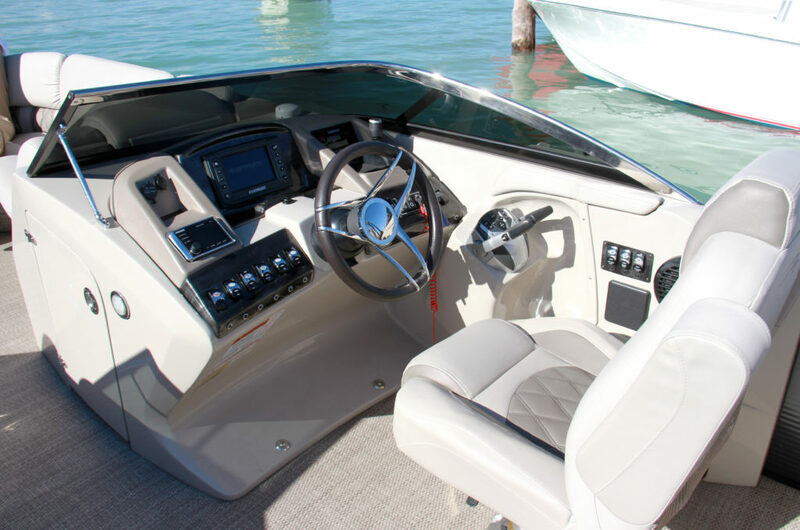 The Indiana boat builder offers another feature since each model is available in several basic configurations that can be customized at will at the time of purchase. In the end, there are hundreds of configurations that are possible in terms of furniture, accessories or colors. This time, we were testing a Bennington Q27 dual console model with a central passage and a large bow rider with seats around it for seven to nine people. 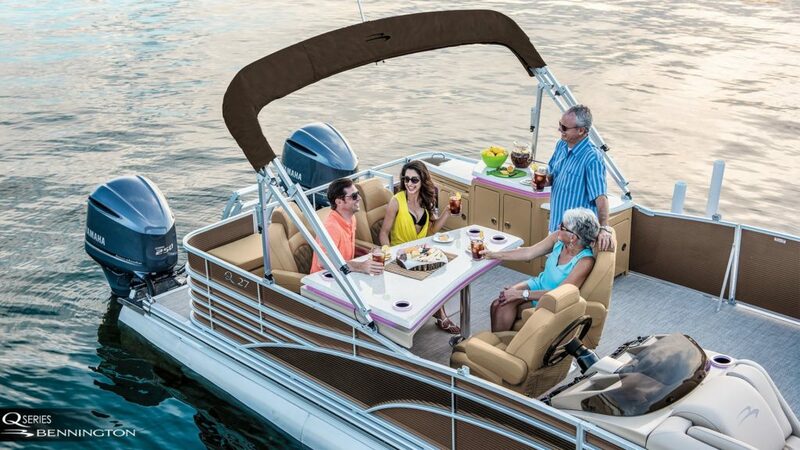 It is also possible to add a central table and the front center seat is removable to give access to the small front platform. 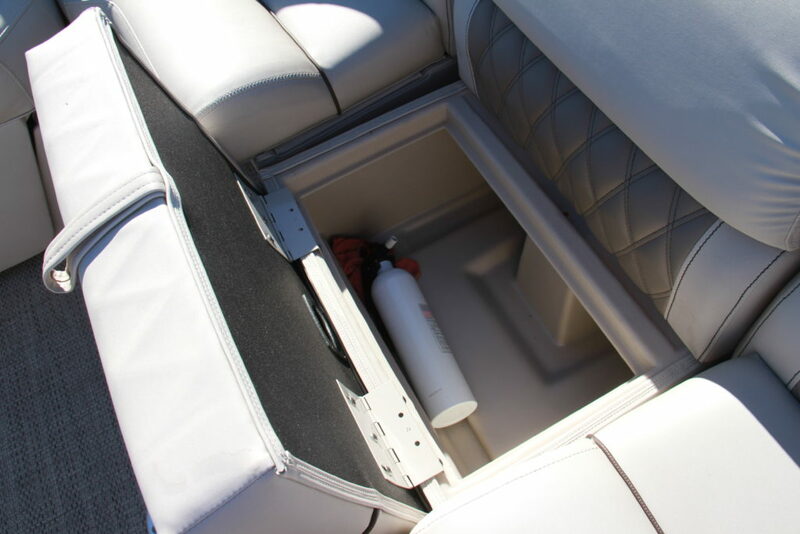 A storage compartment is hidden under each seat and there is also a huge storage unit in the floor. 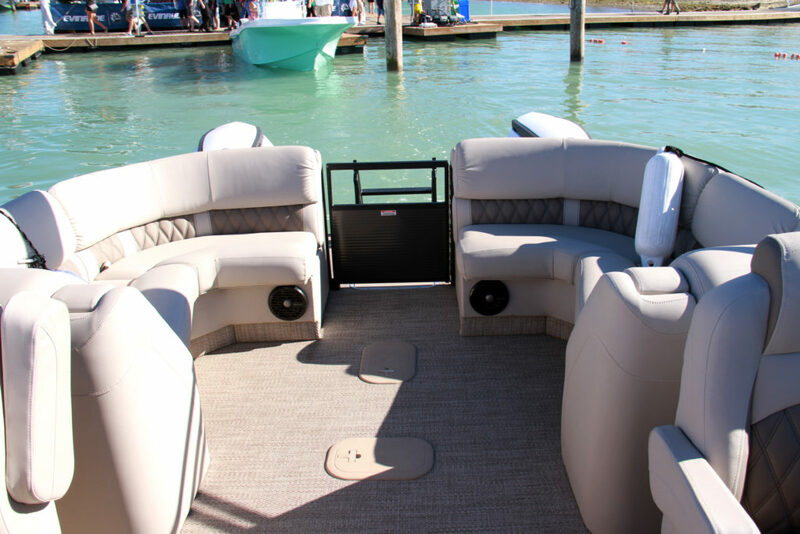 The layout is very similar to the rear with a removable central seat to access the small swim platform and the swim-ladder installed in the middle of the two Evinrude engines. As on the bow, the seats hide several storage compartments. You can also install a table to create a dining area with a kitchen on the other side or even a wet bar if you feel like it. The central part is occupied on starboard by the cockpit and on the port side by another console for the copilot. Each element includes a relatively large storage unit. On the copilot console there are a 12-volt socket and a dual USB. The traffic on board remains easy since at the narrowest part of the central passage is more than three feet wide. Attached to the starboard side, the cockpit is modern and very ergonomic. For example, we notice the arrangement of the small footrest, the space for the knees and the perfect electrical switches. A space is reserved in the center for an electronic screen that can easily extend up to 9 inches, while on the right, a pretty good space is dedicated for the joystick. In terms of practical amenities, there is also a “changing room” which may eventually house a chemical toilet. Finally, the finishing level is quite remarkable and the equipment very complete. If we talk about the building, the Bennington Q27 relies on an aluminum structure platform for maximum rigidity and treated wood flooring. It is also distinguished by the technology of its logs. The Q 27 has three logs. The two side logs have a keel, a profiled front and a small foil on the inside of the tube. 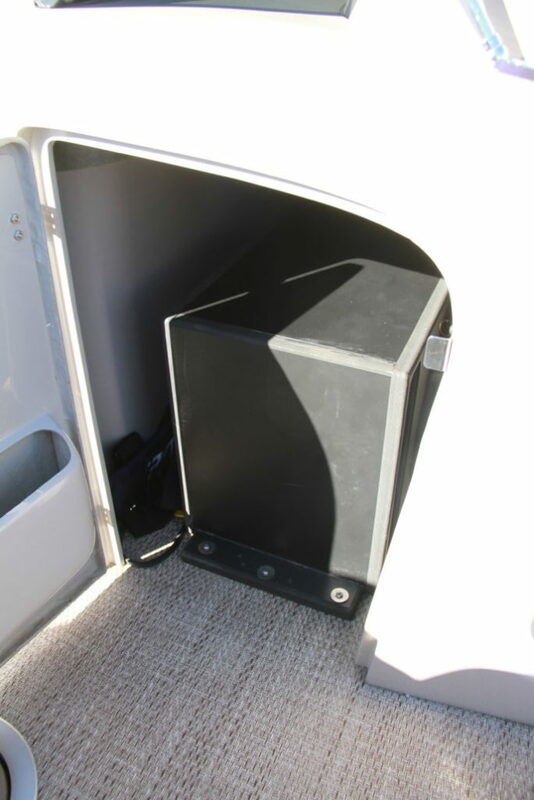 The central log offers a larger diameter to ensure maximum buoyancy and accommodate storage boxes or the tank. The tank is a good surprise, because with its capacity of 83 gallons, it offers very good autonomy to the Bennington. 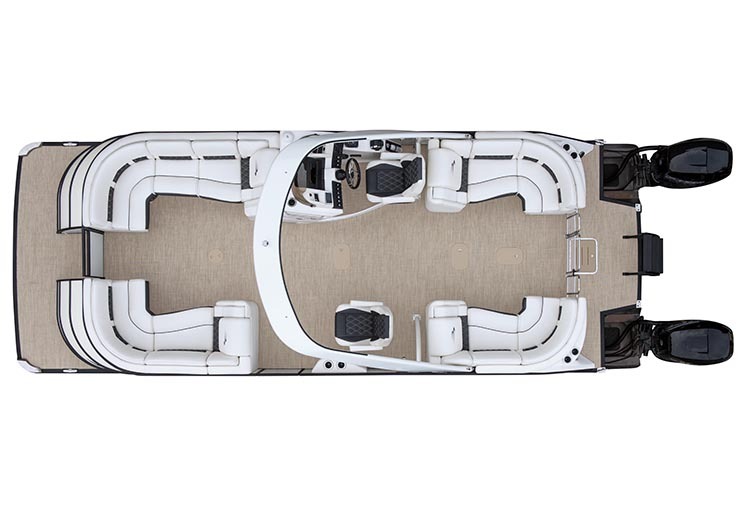 With its three logs, its solid structure and its complete layout, the 27Q is not very light (4,700 lb) and if you add few accessories, a full tank and the engines, the boat easily exceeds 6,600 lbs. 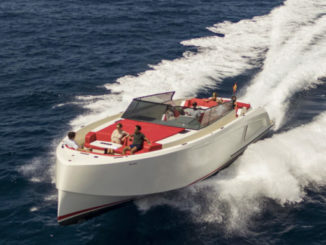 As a result, the shipyard did not hesitate and approved the boat up to 2 x 350 hp. We have tested the boat with « only » 2 x 300 hp Evinrude G2. 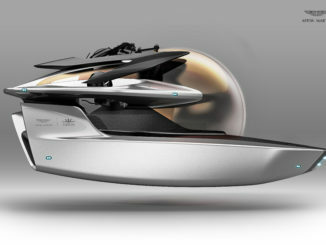 With this motorization, it’s a euphemism to say that the boat is dynamic. However, the most impressive part is the ease with which the Bennington Q27 takes this power. Relatively low on the water, it benefits from a well-placed center of gravity so that the boat keeps it stable. It even handles curves very well and stays very secure in a straight line. Even in the small chop, the boat did not flinch, keeping a clean trajectory and, cherry on the cheesecake, it does not get the crew wet. Still, this engine remains a little extreme especially compared to the family program of the boat. 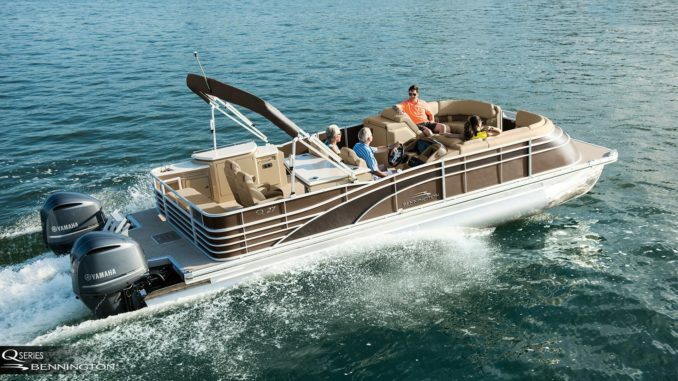 In fact, a twin 150 hp or 200 hp should be enough to make this pontoon boat fast while saving a few dollars as much at the time of purchase as consumption. 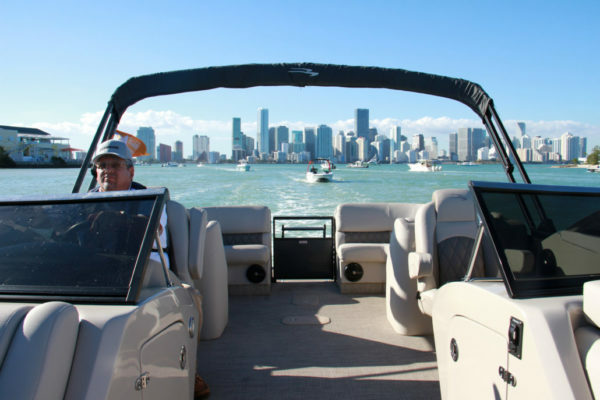 Perfect illustration of what is supposed to be a luxury pontoon boat with comfort and velocity, the Bennington Q27 also testifies to the evolution of the dynamic part, able today to embark safely and with considerable power. 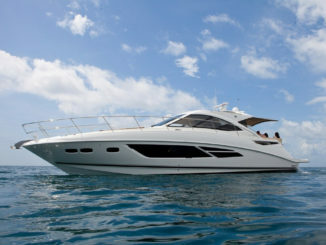 Still, it is expensive, which places it in competition with many cabin boats.